I realized that I hadn't downloaded photos from my camera in quite some time. Since I've been taking pictures with my iphone and posting infrequently to the blog from my iphone, I really didn't pay much attention to the camera. So... I give you photos from our trip to the St Paul Children's Museum in August. 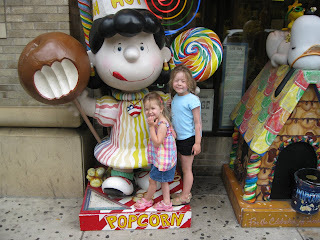 The Peanuts characters are right outside a candy shop next door to the museum. While I ran into a restaurant and ordered sandwiches to go, Adam got this picture of the girls. Clifford the Big Red Dog came out into the atrium and danced with all the kids. The kids taught him the Hokey Pokey and the Chicken Dance. 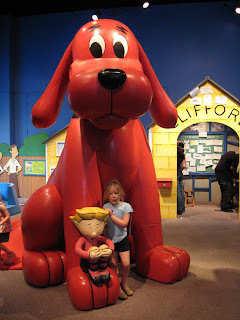 The room with Clifford's town was a big hit with the girls. In fact, you can just barely see Lily sliding down Clifford's tail. Wagging their little beaver tails! The Children's Museum does a great job of having fun animal exhibits. The girls really liked this beaver dam. 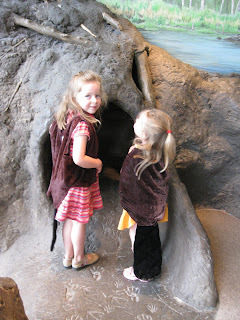 The other highlight was the ant hill, where you dress up as an ant and crawl through tunnels. It was really an amazing exhibit! What a way to spark children's curiosity about the world.